The costs of ObamaCare were to be paid by reductions to Medicare ($500 billion) and taxes on those with high incomes and investments ($500 billion). However, the actuarial and economic analyses don’t take into account the ultimate 100 percent tax on one’s income—the loss of your job. The Obama administration’s Chief Actuary in the Department of Health & Human Services now tells us that ObamaCare will cost much more than Congress thought when it voted for the bill. Instead of saving $114 billion from 2010 to 2019 (as stated by the economists at the Congressional Budget Office—CBO), the administration’s own cost analysis (only a month since the legislation passed) now shows a debt increase of $311 Billion. A $425 Billion dollar cost increase in just one month! As government and regulations grow, individuals become less important, and jobs become scarcer. According to a chart below from the Center for Labor Market Studies, Northeastern University, Boston, Massachusetts the unemployment in the U.S. hits disproportionately on the poor. How can some unemployed have a family income of more than $150,000? Easy, the spouse works, interest from savings, dividend income from stocks, capital gains from investments, and rental properties still provide income for some families while an individual is unemployed or under-employed. Wealthier individuals can have multiple sources of income. For those earning under $30,000 per year the unemployment rate is at depression levels of 15-30 percent. In these ranges, the unemployment plus the under-employment rate is a staggering 28.0—51.5 percent, 5 to 10 times higher than families with incomes over $150,000. Even more telling is the growth between 2007 and 2009 in unemployment in the low income categories. 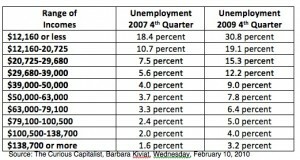 In the three lowest income categories, unemployment increased 12.4 percent, 8.4 percent, and 7.8 percent, respectively. Unemployment in the highest income category rose only 1.6 percent. The Obama administration will point to subsidies to cover the health costs for the low income. Under ObamaCare, up to 58 percent of the population can avail themselves of a healthcare subsidy. But, the opiate of government welfare is the ultimate fix. If the unemployed get a job, the individual subsidies begin to decrease. The financial impact of welfare subsidies is the equivalent of a higher marginal tax rate. 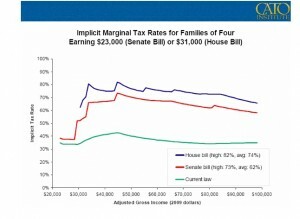 A Cato Institute study shows, for those making $30,000, the equivalent marginal tax rate will be nearly 60 percent. That is, for each additional dollar earned, the government will take back sixty cents in taxes and reduced subsidies. That doesn’t provide the poor much incentive to work hard and advance economically. We learned in the 1990s that the welfare state established in the 1960s destroyed families and created a culture of generational poverty. In 1997 working with a bi-partisan Congress, President Clinton eliminated welfare as we knew it. He replaced welfare with workfare. Sixty (60 percent) percent of welfare recipients got an education and real jobs, Children saw their parents go to work and earn respect as well as a pay check. With ObamaCare, we are returning to the failed government dependency model that destroyed personal responsibility, family values, the work ethic, and the public’s sincere desire to help families in need. The ObamaCare health welfare subsidies for low income do not offset the effective jobless 100 percent tax. ObamaCare will inhibit the desire for most to advance to the American dream of self-sufficiency, home ownership, nice furniture, college for children, a good car, an annual vacation, debt free living, and financial security. Surely, at some point rationality rather than power politics will prevail. Are politicians that corrupt? Are people really willing to financially subjugate themselves to Washington? Does anyone actually believe that the wealthy won’t respond by shifting earnings, moving assets, lowing wages to their employees, and otherwise legally avoiding confiscatory taxes and penalties? Nearly 6 million of the 15 million unemployed make under $30,000 per year. The numbers are staggering. The real intent of health reform was to redistribute wealth. However, the poor always wind up paying a heavy price for governmental assistance. A government health welfare subsidy does not support a family or create the dream of a better future. Government welfare subsidies rob from the rich and steal dignity from the poor. Government dependency from lost jobs is the most insidious, destructive, and cynical way to govern. Ronald E. Bachman FSA, MAAA, is a Senior Fellow at the Center for Health Transformation, an organization founded by former U.S. House Speaker Newt Gingrich. Nothing written here is to be construed as necessarily reflecting the views of the Foundation or the Center for Health Transformation or as an attempt to aid or hinder regulations or the passage of any bill before the U.S. Congress.